New Listing! Our 6 bedroom / 5.5 bathroom home sits on over 6 acres! 4-10 minute drive to the base of Stratton and 2-3-minute drive to downtown Winhall. A short drive to multiple state parks! If you want to check out another mountain there are 4 other ski mountains driving distance from the house! 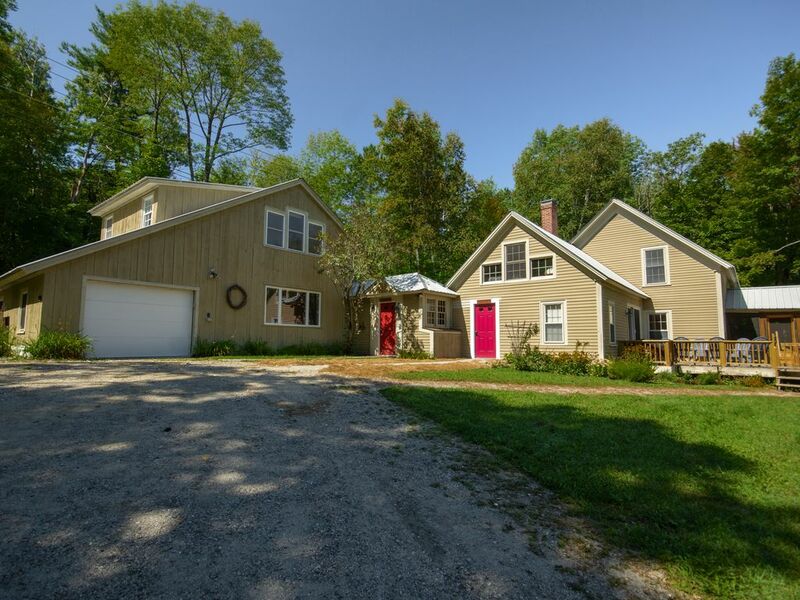 This listing includes the entire property which consists of a large Farm House as well as a two-story Guest House beautifully set on over 6 private acres! Across both spaces there are a total of 6 bedrooms, 13 beds (including the 2 pull out couches), and 5.5 bathrooms! Some of the amenities include a sauna, covered patio, uncovered patio, two 55” TV’s with a large selection of channels, high speed internet, + more! The first floor consists of a Kitchen / dining area, full bathroom, large living room with wood burning fireplace, foosball table, sauna, master bedroom suite with a queen size bed and an additional full bathroom. The lower level consists of a dining table, kitchen, half bathroom, sectional with pull out memory foam queen bed, TV, + more! The upper level consists of one large bedroom with 2 queen beds, a pull out full size bed, TV, and a wet bar if you want to make yourself a night cap! When you book this listing we open up an interior room that contains a Foosball table to interconnect the Farm House to the Guest house! The house is located on Lower Taylor Hill Road next to the intersection of the Stratton mountain access road. Lower Taylor Hill Rd is one-way so it will take longer to get to the mountain vs coming back but on average will only take 4-5 minutes from mountain and 8-10 minutes to the mountain depending on traffic. We have a dog that frequents the home so if you are allergic please take this into consideration. There’s a spiral staircase to access the top floor. There's a separate exterior staircase that goes to top floor to carry up larger suitcases, etc. The farm house and guest houses are family friendly but aren’t kid / baby proofed. The home is basically split in two with one large older home and one smaller home. They both sleep lots of people! The great thing about having both homes was having two kitchens. We were 5 families with 6 kids and it was perfect! The home was clean and filled with everything you would need. We had a great time!! Thank you for sharing! Taylor farmhouse was perfect for our large and age-diverse group which ranged from our adult (20/30-something) children to our 2, 5, 6, 7 and 8 year-old grandchildren, and there was plenty of space to stay out of each other's way thanks to the two separate living spaces. The farmhouse and guest house were clean and uncluttered with comfortable furniture and beds and 2 full kitchens so we could prepare big meals without tripping over each other. The house is in close proximity to Stratton Base which was great because we shuttled the small kids back and forth as the temperatures were well below freezing. The owners were extremely responsive to any questions we had, and checked in during our stay to make sure all was well. I would highly recommend the Taylor Farm House and hope to return.